A new €14 million waste sorting facility will help the island process larger volumes of recycling in a bid to improve Malta’s poor track record on waste management, according to a new tender agreement. The Multi-Material Recovery Facility will be run by State waste management firm WasteServ on land next to an existing bring-in site in Ħal Far. A tender for the construction of the facility was issued last year and the winning bidder, BS Joint Venture, was announced by the government yesterday. “The proposed facility aims to expand the waste types processed locally,” the tendering documentation reads. It adds that the facility will be constructed by the bidder to accept a variety of waste streams that would otherwise be disposed of at the island’s landfill. Recycling has been repeatedly highlighted as a major failing in Malta’s waste management efforts over the years, and the island recycles the smallest quantity of municipal waste in the EU. 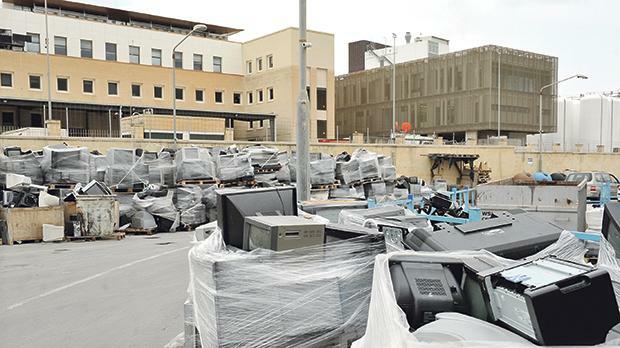 Last year, the Times of Malta reported how the island’s main landfill was expected to reach full capacity within two years, triggering the government to hold a public consultation on the matter. What followed was the announcement that a hazardous waste dump would be converted to be used for routine dumping of regular waste as an emergency, stopgap solution. The announcement preceded that of a controversial waste-to-energy project, which will see a less polluting version of incineration process for a large chunk of the island’s waste. The Times of Malta has since reported that this plant will be located next to the Magħtab landfill. Meanwhile, recycling levels continue to fall drastically short of expectations. According to the tendering documentation, the Ħal Far facility will form part of a process in which waste streams are segregated and pre-treated, packaged and dispatched for export. Unsorted flat glass, wood, electrical and electronic equipment waste (WEEE), tyres, polystyrene, gypsum, mattresses and a variety of other textiles will all be processed at this new site. Trucks entering and exiting the facility will be weighed using one of two weighbridges to get an accurate picture of the weight of material dumped. Multiple drop-off points will enable trucks carrying different waste streams to unload material in distinct areas, the tender document reads. Once the material has been processed or “containerised”, it will be moved to an underground level via an array of loading elevators for temporary storage. Waste electrical and electronic equipment will be palletised before it is stored and tyres will be processed by a tyre baler to maximise density for logistical benefits. Wood and mattresses will also be downsized via shredding by means of a mobile multi-material shredder. Polystyrene will be compressed and baled, as will gypsum and textiles. The materials will then be transported to the Freeport for export. Any rejected materials will be taken to the landfill. Wasteserv chief executive Tonio Montebello said the site was not meant to replace the Sant’ Antnin plant, which burnt down in 2017. According to the documentation, a daily penalty of €15,000 will be imposed if the project for this new facility is delayed, and it must be finalised and delivered within 24 months.